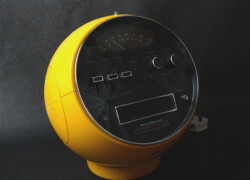 Item description: This rare and iconic radio / 8 track player was brought out in 1970 by Prinzsound, and immediately became more affectionately known as the ‘Space Helmet’. 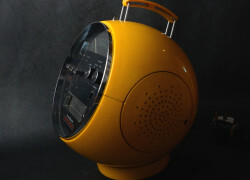 The unit has a circular yellow case with integral speakers, fully retractable aerial, and carry handle to the top, which is also fully retractable to the case. 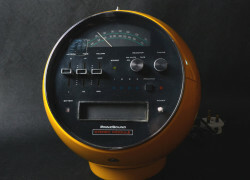 Front instrumentation includes radio, along with 8 track player. 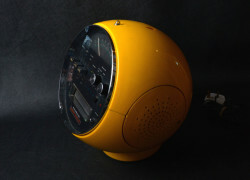 A compartment at the rear allows the unit to be run on batteries as opposed to mains, if one wishes to. 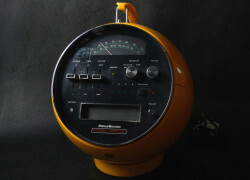 This was a particularly high quality and expensive unit of its day, and the radio sound is excellent even by todays standards. Home ‘cool’ doesn’t get much better than this ! 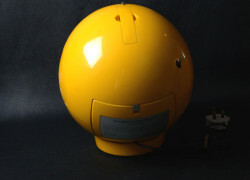 Condition report: This particular unit survives in close to mint condition, with excellent frontal appearance and good even original yellow colour free from any blemishes or cracks. The aerial fully retracts, and the carry handle also retracts and opens correctly. The unit has just been fully overhauled, at which time the drive belt was replaced, internal switches cleaned and the 8 track head aligned (no warranty implied).